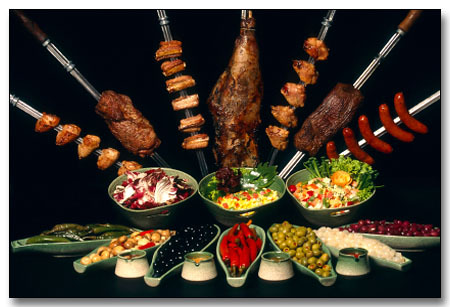 Brazilian Barbecue – Do you know it?? Grab your sword, light the fire and get grilling!!! Barbecue is part of the Brazil’s Culture . Brazilians love to gatther around the grill area and wait for the perfect meat get ready. I want to introduce you to our history , just to let you know some more about this continental country that really loves to eat meat !! More than 400 years ago cattle ranching was introduced to the Rio Grande do Sul, in the South region of Brazil. The brazilian “Cowboys”, called “Gauchos” herded these cattle, and like the cowboys of Texas created a new style of cooking. They called it “Churrasco”, which is Brazilian Barbecue. Though this style of Barbecue wasn’t based on smoke like that of the United States, it has all the traditions and elements of an American Barbecue. Churrasco started in the 16th and 17th centuries and spread throughout all of Brazil in the 1940’s as the Gauchos spread across the country. Originally the standard formula for Brazilian style barbecue was to coat meats in coarse salt. The meat would then sit for about 30 minutes to absorb the salt and then was placed over the fire. Later a salt-water baste was used to keep meats moist during the cooking. Beef was typically never seasoned. Poultry and lamb, however are spiced with a rich marinade the night before cooking. Meats are places on long sword-like skewers and cooked over an open fire. Churrasco is much more than a way of cooking in Brazil ; it’s a way of life. The Barbecue capital of Brazil is the city of Nova Brescia which has a statue of a man cooking barbecue in the central plaza. In the 1940’s this city had a population of about 150,000. Since then the population has dropped to about 30,000 due to the mass exodus of people leaving to open Barbecue restaurants across the country. The popularity of Brazilian Barbecue has lead to the founding of dozens of restaurants, popping up all over the world. If you get the chance I whole-heartedly recommend that you give one a try. On the menu you will usually find prime rib, linguica (a Portuguese sausage), lamb kebabs, chicken legs, fish and a whole host of other dishes. All meats are cooked on long skewers placed on racks over the fire with fattier items placed on top so that the juices will drip down and flavor the other cuts. When the meats are cooked waiters carry the skewers around table to table carving off pieces onto your plate. Without moving from your table you can experience virtually unlimited dishes until your stomach fails you and it’s time to lumber home. This is truly a great dining experience. You can experience this at home. Kebabs are one of the easiest things to grill. And since the tradition is to place only one kind of meat on each skewer the problem of different cooking times is eliminated. The next time you have an army over try a good Brazilian Barbecue.